A points-based reward system for employees could be perfect for motivating your organization. If you're planning to reward employees for many different actions - over time, and allow them to receive and save point-rewards, to be redeemable for merchandise awards, then you are at the right place. We offer different options to fits your needs and budget. 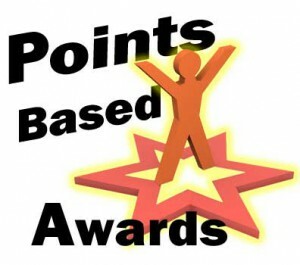 Employee Points Programs - why use them? The simple answer: Points-based employee reward systems have been consistently proven to WORK! Research has proven that companies giving regular thanks and recognition to their employees far outperform those that do not. Plus, higher performing companies actually had almost 30% lower voluntary employee turnover rates. If regular and frequent recognition is so successful, why aren't more companies doing it? Points-based employee reward programs are powerful and exciting motivators, allowing management to reward employees with Points for their performance, and other desired actions. In this type of recognition program, employees usually will have multiple opportunities to earn points for their various achievements.